MY SIDE OF THE RIDE: HELMETS DON'T PROTECT YOUR BRAIN...Period. HELMETS DON'T PROTECT YOUR BRAIN...Period. More on helmets. Why? Because, as a cyclist, I think a helmet should do more than just make sure I don't fracture my skull or sustain a serious laceration. While those are important, my brain is more important. This is a story, finally coming to light, about football players, who thought using a helmet would protect their brain. Guess what??? WILLOW PARK, Tex. — The Hall of Famer Rayfield Wright’s increasingly imperfect memory retains an indelible image of his first N.F.L. start. It was November 1969. The Dallas Cowboys against the Los Angeles Rams. Wright, a Cowboys offensive tackle, lined up opposite Deacon Jones, the Rams’ feared defensive end. “What does my mama have anything to do with this?” Wright recalled thinking, losing his concentration just long enough for the ball to be snapped and for Jones to slap his dinner-plate-size right hand violently against Wright’s helmet. He hit him so hard that it sent Wright tumbling backward. Wright remembers being knocked out, then waking to see a galaxy of stars as he lay on the turf, unable to move. “It was as if I’d just been hit in the head by a baseball bat,” he said. He turned toward his sideline, looking to Coach Tom Landry for help. Landry just glanced at him, and then turned away. For the longest time, he was sure that was true. It took Wright nearly 40 years to recognize that he probably sustained a concussion in his first N.F.L. start, one of many head injuries he says he had in 13 seasons with the Cowboys. Only recently — albeit through the fog of his worsening dementia, which he acknowledged publicly for the first time last week in an interview at his Texas home — has he realized that he is not in this by himself after all. Wright, 68, is among more than 4,500 players who have sued the N.F.L., contending that the league concealed for years what it knew about the dangers of repeated hits to the head. This month, a federal judge rejected a proposed $765 million settlement that would compensate players young and old for those injuries. The judge, Anita B. Brody, was exactly right to express concern that the settlement was too small to pay for medical tests and treatment for the thousands of players who face — or could face — health problems related to their N.F.L. careers. She wants assurance that the current proposed payout will be enough, and she has asked the league’s lawyers to justify their math. The N.F.L. has argued that its offer was “fair and adequate,” but it should be ashamed to even suggest such a figure. The league generates revenue of about $10 billion a year, and the $765 million was earmarked to cover all claims over a 65-year period. It’s no surprise that the N.F.L. is trying to get out of the lawsuit on the cheap after years of denying a link between football and brain injuries. But it could — it must — do better. Much better. Figuring an adequate settlement may be impossible. Some plaintiffs, furious that they may have paid a terrible physical price to make the N.F.L. rich, are demanding that the former players hold out for more. But men like Wright need that settlement money now. Studies have repeatedly shown that N.F.L. players encounter dementia, Alzheimer’s and other neurological diseases with greater frequency than the general population. Many players can look at Wright and see what their future might hold. Those who try to ignore the grim possibility of life after football are fooling themselves. Until I spoke with him last week, Wright said he had long been “too proud” to tell anybody about his deteriorating mental health. At 6 feet 7 inches and 265 pounds today — only 10 pounds more than his playing weight — Wright would still be a commanding presence in the Cowboys’ locker room. But inside his home in this small country town about 20 miles west of Fort Worth, a place he moved to partly so that few others could see his decline, he described what he believed were the effects of his football-related brain trauma. Even more startling than his icy stare were the tears welling in his eyes. Wright knows that waiting for a better deal won’t help him, that time is not on his side. Now, more than 30 years after retiring from the N.F.L., he is still considered one of the best offensive linemen ever. But DeVader said Wright, who for his safety cannot be left alone, can barely make ends meet. His monthly income is less than $2,500, DeVader said, including his $82.20 N.F.L. pension. He owes, DeVader said, “tens of thousands of dollars in medical bills” and has no private health insurance to cover what Medicare doesn’t. Last year, Wright received some relief. In August, a plan run jointly by the league and the players union agreed to reimburse him for some of his dementia-related medical bills. But that plan, which pays each qualifying player’s medical costs up to $88,000, does not cover anything related to Wright’s many other health problems. Wright needs more help. Under the proposed settlement, former players found to have dementia at his age would receive $380,000. He’ll take what he can get. In 1969, when he was lying on the field of the Los Angeles Coliseum after being head-slapped by Jones, Wright didn’t give a thought to brain injuries and how they would affect him later in life. Like many players, he suffered silently through headaches, dizziness and bouts of unexplained irritability that often turned to anger. 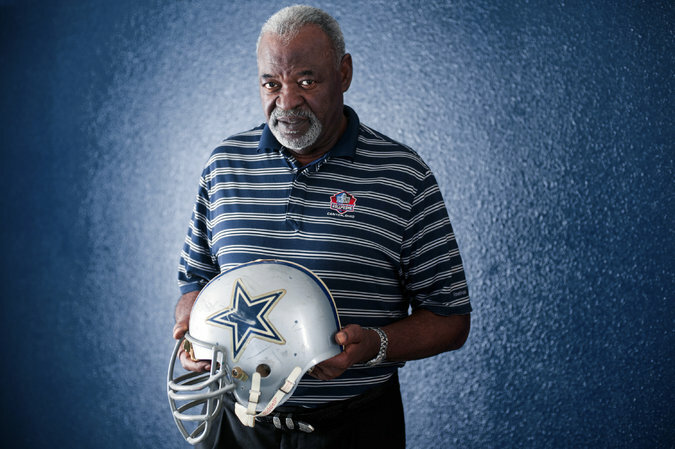 In an effort to maintain his image as a leader — Wright was an Eagle Scout and a Cowboys captain — he also kept to himself that he had retired at 34 partly because of his growing inability to understand the team’s plays. The money he made during his Cowboys career — which included five Super Bowls, two of them victories, and six straight Pro Bowl seasons — was enough to buy his grandmother and mother a new home in Georgia. It was also enough for him to lay the foundation for a group home for at-risk boys in East Texas. A cross between coach and preacher, Wright became a charismatic motivational speaker, often reciting “The Road Not Taken” by Robert Frost, a poem he memorized in eighth grade. But he remained quiet about the strange and frightening things happening to his mind and body. He quit a banking job after only two years because doing math and processing numbers had become too difficult. He stopped driving after having four accidents in recent years, a result of the seizures that have plagued him since he left the N.F.L. Wright had one seizure in 2006, on the morning it was announced that he was to be inducted into the Hall of Fame, but he recovered quickly enough, and without medical aid, to meet with reporters hours later. But by then, his finances were on shaky ground. Within two years, DeVader began noticing a change in Wright’s personality, too. The sweet and caring man she knew was losing his temper more and more. She said he had made some questionable personal and financial decisions, and lost large sums of money. A neurologist told Wright he had depression, but Wright and DeVader suspected something more serious. At times, he would call her to ask for help with household items whose names he had forgotten. Sometimes, he would lash out without provocation, as he did during our interview. In 2012, Wright saw yet another neurologist. That one diagnosed his early-stage dementia. But he continued to hide his illness when he gave speeches and signed autographs. Wright gave his last big speech 10 months ago in his hometown in Georgia. But when he began to recite “The Road Not Taken,” words he had spoken hundreds of times since childhood, he stumbled after only three lines. He meandered through the rest of his talk, and now DeVader makes sure he no longer accepts invitations to speak at length. During the interview, Wright fought to stay focused, and for the most part won. Now Wright knows. In his modest home at the end of a cul-de-sac, he is surrounded by football memorabilia: game balls, plaques, trophies, the keys to more than a half-dozen cities. They are reminders of a past life. Memories gathering dust. Wright said he didn’t attend the Super Bowl in Arlington, Tex., in 2011 because he was afraid of having a seizure in public. This Sunday, he may or may not settle into his velour recliner to watch Super Bowl XLVIII. He wants to watch. But his attention span has grown too short, DeVader said, and he’s too depressed to sit through an entire game, even the biggest one of the season.